So I’ve technically done my first drum solo now. Sure I’ve drummed for dancers for years and have played for who knows how many dancers, but tonight (or technically, last night) I’ve performed my first honest to goodness drum solo. Sure, I’ve been in settings where I’ve played back up for another drum soloist (and I understand that the idea of a ‘drum solo’ can be confusing when it can include more than one musician and/or dancers, but indulge me for a bit) and have drummed ‘solo’ in workshop settings for dancers playing rhythms as a teaching tool for workshop attendees. But never as a soloist in a performative setting. The biggest irony here is that the many years of playing drums included mainly playing Egyptian tabla or other Middle Eastern drums for mostly bellydancers (the occasional gig playing with Greek bands or my Balkan band, Kermes for Greek folk dancers and Balkan folk dancers notwithstanding). What is ironic is that my first drum solo happened to be on the doira, for Uzbek dance. And it looks like most of my drum soloing will include many more Central Asian styles–the next piece that Raks Makam will be working on is a Bukharan doira solo. I’m stoked for this and so looking forward to learning more about all this wonderful Central Asian music! Most importantly, I just love working so closely with dancers. Really I love working with any collaborators in general, but especially non-musicians, and most especially with artists in an art form that is so closely tied to music as dance is. Being a soloist (musician) means a couple of obvious things. No one else is responsible for learning the music but me, which means that while I have no one getting in the way of picking up a new tune. The other thing is I also have no one else to rely on if things go awry musically. I’ll trade the one pressure for the other in a heartbeat! Ok, I must get some sleep before heading up to Chicago to play some Klingon music! 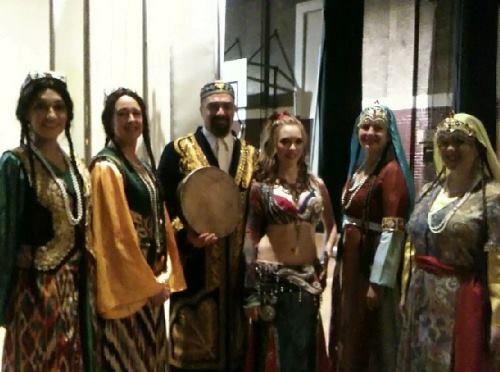 So last night I had the opportunity to perform with the Eastern Caravan Group in Bloomington, Indiana. I was sent a handful of sheet music to work with just a couple days ago, but ironically I ended up using practically none of them. 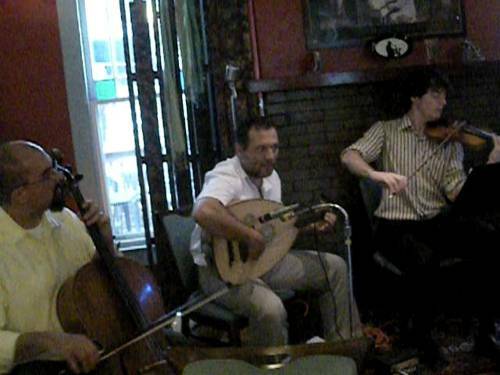 I was initially just invited to perform whatever I was comfortable with from the music sent but as soon as I heard a tune announced that I knew (albeit, in a completely different key) I reached for my cello and looked at Shahyar Daneshgar (the de facto leader of the esnemble) and he just nodded and smiled. So what was supposed to be a small guest appearance with the group by me ended up with me playing the whole evening (minus the first couple of tunes) with the group. And it was an absolute blast. The two or three tunes the group played that I did know were all in different key areas than I had learned or performed and the arrangements were completely different but that hardly mattered to me, apparently, as I seemed to have no problems transposing the melodies to the new tonal areas without much effort (which actually surprised me, even). And as Shahyar Müellim had, in our initial correspondence, wanted me to play more in the bass range, I was also transposing down two octaves. The whole evening was like that with the exception of a popular Azeri dance tune we played for one of my partners in Raks Makam who happened to be able to make the show. I was alternating between playing bass function (when chordal harmonies were somewhat implied) and playing the melodies (by ear and in real time) down two or three octaves. The gel holding the two alternating functions together were improvisational transitions or elaboration/ornamentation of the bass or melody line. 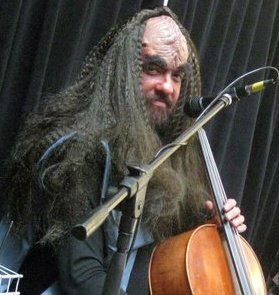 Keep Louisville Weird with Thai-singing Klingon Cellists! So a couple days ago I was actually asked to play an upcoming event, the Terrabeat Showcase, that is going to “feature local ‘worldbeat’/cultural musicians from the city’s immigrant communities who are not yet fully integrated into Louisville’s mainstream music scene so that worldbeats influence in Louisville can be enhanced.” Some of the other ethnic musicians to be featured will be Indian, Somali and Bhutanese immigrants. I supposed I’ll be representing the Thai and, um, Klingon ethnic groups? As I’ve been doing more solo cello as well as music/dance related duets lately, it’s only natural (I suppose) that I *ahem* boldly go where no cellist has gone before. Not that this would necessarily be much of a stretch for me. I already sing in Thai (and Klingon plus a few dozen other languages) while playing cello (and other instruments, such as dumbek). I already have a huge untapped reservoir of material to use and styles to combine (though I’m not sure how I would incorporate beating amplified sheet metal through effects pedals into this show–though I could totally see Klingons doing this kind of thing). Point is, it’s always nice to not have to rely on the schedules and limitations of others, especially when experimenting with new things. I still have yet to fully develop Klingon Music theory given the existing canonic (and not so canonic) material, though that is still [yet] another work in progress. And while I don’t often sing in Thai (just not that much opportunity for that yet, or rather not enough time to develop that) the first tunes I ever learned how to sing were Thai songs, and I still occasionally sing them when the need hits. Jon Silpayamanant singing a Thai Classical Chant for Kristi Renee who is doing a fusion dance with Thai Fan Leb (fingernail dance) and Bellydance. Kira's Oasis (Dayton), January 2007. But the idea of showcasing ethnic music (whether dressed as a Klingon or not) just appeals to me, and as my mother often tells me when she wants me to look for Thai movies and/or music or her, sometimes I just get tired of hearing the English language. And more ethnics [sic] need to play out if only so that local communities don’t get a false sense of what’s actually out there in their [local] worlds. And with a little luck, folks that perform can be what’s called in psychology, disinhibitory contagion. This is a robust psychological phenomenon where folks who would generally follow the pack, because of whatever psychological rationalization they have made, do something that they really wanted to do after having experienced someone else going against the grain. We sometimes see the negative side of this thing as when a high profiled (in the media) suicide coincides with a sharp spike in suicides by folks who somehow identified closely with the media personality. 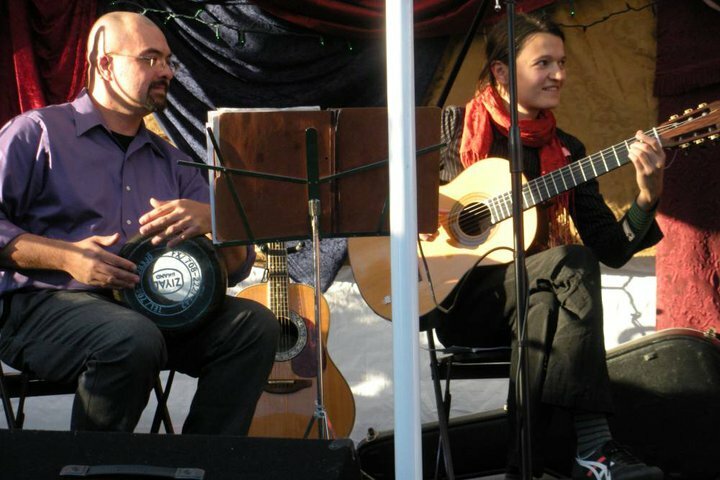 But I think the positive side of this is to have more and more folks, who don’t normally play Western music (whether Classical or Pop) decide that it’s really OK for them to get out their sitars, koras, tablas, ouds, kavals, or whatever instrument from the homeland and get their funk on. And from my own experience (which is considerable as I’m active playing in or working with 1) Balkan Band, 2) Klezmer Band, 3) World Music Ensemble, 4) Greek Musicians, 5) Central Asian dance/music project, 6) tabla/cello Indian/Middles Eastern Fusion project, etc.) Caucasian Americans are getting just as interested in this new music. Let’s face it, you can go anywhere to see a Symphony (though that might be getting rarer these days) Orchestra, or a cover band playing top 40 hits, or an original band singing in English and playing in an Anglo-American rock style, right? And that’s the stuff that permeates the normal radio and other traditional media outlets. How many Beatles cover bands do we need anyway? Anyway, I’ll be developing a show for this and I suspect it will be something completely different than all the other things I do–or rather, it might be something that completely melds everything else I do!